Image search results - "japanshrine"
Osakabe Shrine on top floor of Himeji Castle. This shrine was already on the hill before the castle was built. The shrine was moved when the castle was built, but it was brought into the castle after some "curses" occurred. Offertory box in front of the main shrine. That's money on the floor. The high structure is the main shrine (Honden) standing 13 meters high. Built in 1604 by Tokugawa Ieyasu. In the distinctive sengen-zukuri style. Eastern torii of Fujisan Hongu Sengen Taisha Shrine has a great view of Mt. Fuji. Hakone Shrine's torii you see from the pirate boat on Lake Ashi looks tiny, but it's actually a giant torii of Hakone Shrine. Comparable to the torii at Miyajima in Hiroshima. Not doubt one of the most photographed in Japan. Kotohira Shrine has this unique affiliate shrine named "Kishima Shrine" (木島神社) which is the left half of this building. (The right-half shrine is Sarutahiko Shrine [猿田彦神社] for the god of transportation and directions. )Kishima Shrine is unique in Japan for these two koma-neko cat guardians. Shrines usually have koma-inu lion-dog guardians (to ward off evil spirits), but only this shrine in all of Japan has cat guardians instead. Kyoto Ebisu Shrine on its busiest day of the year. As people ring the bell and pray for prosperity amid the current recession, the shrine rakes in the money on its most important day of the year, Jan. 10. Stone lanterns leading to Kasuga Taisha Shrine. Kasuga Taisha Shrine bright vermillion color contrasts with the dark brown tones of nearby Buddhist temples. Meiji Shrine's main worship hall. If you look closely at the wooden pillars, you can see numerous little cuts in the wood made by people throwing coins at the shrine during New Year's. Two wedded tree trunks (楠) coupled by a sacred rope at Meiji Shrine. Meiji Shrine is also popular for holding weddings. On weekends, you can see several couples passing through. Mishima Taisha Shrine in Shizuoka Pref. This is the main torii. Townsend Harris, US consul to Japan, visited here when he was on his way to Tokyo from Shimoda. Mishima Taisha Shrine Honden is an Important Cultural Property. Namura Shrine's Romon Gate, Ryuo, Shiga. Important Cultural Property. Tanashi Shrine is dedicated to Ookuni Nushi-no-Mikoto. 大国主命（おおくにぬしのみこと）in Nishi-Tokyo, Tokyo. Otori Taisha shrine suffered major damage from Typhoon No. 21 in Sept.2018. Part of the roof on the main shrine was damaged. Honden main hall of Shinagawa Shrine, one of Shinagawa Ward's major shrines. Dedicated to Amenohirinome-no-Mikoto, Susano-o-no-Mikoto, and Uganome-no-Mikoto. Near Shin-Bamba Station North Exit on the Keihin Kyuko Line from Shinagawa Station. Sorihashi Bridge (反橋) is a symbol of the shrine and one of the larger taikobashi. Wakamiya Hachimangu Shrine, a secondary shrine of Sumiyoshi Taisha. 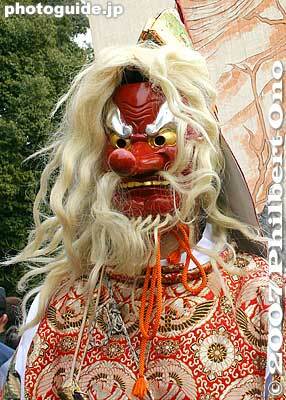 Worships Hachiman (Emperor Ojin), the guardian deity of the samurai. 若宮八幡宮Hachiman (Emperor Ojin) was the son of Empress Jingu. Nankun-sha cat shrine altar (楠珺社). It promotes "Hattatsu" worship. At Sumiyoshi Taisha, Osaka. 初辰まいりYou supposed to come here and worship monthly and collect a total of 48 cat figurines over a period of 24 years. Then you'll get the jackpot of family safety and business prosperity. It's based on a play of words with "48" (shijuhachi) that can be pronounced similarly to "shiju-hattatsu (始終発達) which means "constant advancement or development." Tiny beckoning cat figurines at Nankun-sha cat shrine at Sumiyoshi Taisha. Larger beckoning cat figurines at Nankun-sha cat shrine at Sumiyoshi Taisha. Taikodani Inari Jinja Shrine's many toriis going up the mountain. Yushima Tenjin Shrine was one of Hiroshige's "100 Views of Edo" ukiyoe primt series. Honden main hall during the Chrysanthemum Festival in Nov. Bunkyo- Ward, Tokyo. Torii of Kobiyoshi Shrine and giant torches in the distance, Ryuo, Shiga Prefecture.